It is notoriously difficult to control the firing of underglaze copper red and still more difficult to control it in combination with underglaze cobalt blue. Here the line of the blue is unusually precise and sharp, while the copper red has also fired to an ideal color. 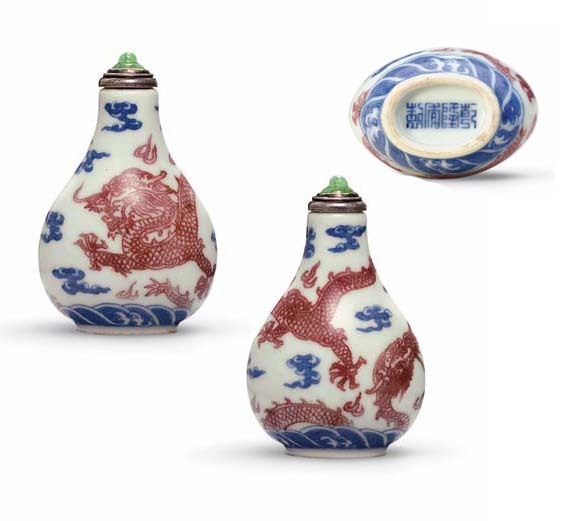 The present lot bears one of the earliest known underglaze-blue Qianlong marks on porcelain snuff bottles. One of the Twelve Symbols of Sovereignty, and thus representing the Emperor, the dragon is also symbolic of the natural world, adaptability, and transformation. Mary Margaret Young was the daughter of Earl B. Finning, the founder of Finning Tractor and Equipment Co. Ltd., and was educated at Pomona College and the University of British Columbia, where she studied philosophy. She met her husband Maurice (Maury) at UBC and together they embarked upon a lifetime devoted to building up the business and to community service and philanthropy. Their philanthropic work included working closely with the UBC Foundation; the Lester B. Pearson College; the Institute of Global Ethics, where she served as a director of the board; Arts Umbrella; Vancouver Library; the Vancouver Aquarium, and working to educate the disadvantaged members of the local community. Another contribution was the Mary M. Young Global Citizen Award, given annually to an international student from Lester B. Pearson College who would otherwise have been unable to afford to pursue a university education in Canada. She also supported her alma mater and many other charities in the United States throughout her life. Her attitude to philanthropy and to her local community is summed up by a comment she once made about this award: "If we are going to change this world it will be done one person at a time, one step at a time." As a collector, Mary Margaret Young had two main interests: twentieth- century Canadian paintings and Chinese snuff bottles. She was enthusiastically supported by Maury in both endeavors, and although when it came to her snuff-bottle collection she was the driving force, she would always look to Maury for his agreement of her final selection and he was always there by her side to offer his opinion and encourage her to exercise hers. Their Canadian painting collection was second to none in private hands and too large for their apartment in Vancouver, necessitating the storage of some of it at the Vancouver Art Gallery while many paintings were given to various Canadian art galleries and museums so that future generations of Canadians could enjoy them. One of her paintings by Lawren Harris appeared on world-wide TV when the Canadian Prime Minister held a summit conference in Vancouver. The snuff-bottle collection is one of the finest formed during the second half of the twentieth century. She was initially attracted to snuff bottles she saw in local antique stores in Vancouver, primarily Potter's Gallery. Having acquired a few based entirely upon personal taste and trust, she decided to take the subject more seriously. Like so many of her fellow collectors at that time, she was inspired by the first serious book on the subject in English, the seminal Chinese Snuff Bottles - The Adventures and Studies of a Collector, by Lilla S. Perry. Charmed by her random acquisitions, she devoured the information in Perry's book, as did all collectors in those heady days of innocence in the snuff-bottle world - there was little else available to inform the serious student. By the late 1960s, she had begun to seek out other collectors and had discovered a periodical devoted to the subject (Chinese Snuff Bottles, edited by Hugh Moss, a specialist dealer who had recently opened a gallery in London who was also inspired by Perry's book). She visited him, which led to a life-time association between the two and to a particularly close friendship with his assistant, Eunice Cameron, who for many years would travel regularly to Vancouver to offer Mary Margaret a steady supply of fine examples, and advise her on auction purchases around the world. On Eunice's first trip to Vancouver the inevitable critical examination of the existing collection took place. As is so often the case with uninformed, random selection in unfamiliar artistic territory, much of it was earmarked for disposal, but a few excellent examples survived the process. Instead of being discouraged, Mary Margaret set about collecting seriously with her characteristic optimism and enthusiasm. Cameron was fond of quoting her response to what for most collectors would be a rather depressing and off-putting experience: "Oh good! Now that we know what to throw out, we can do the job properly!" And she did. From the late 1960s she devoted her energy to acquiring many of the finest examples on the market, whether through dealers or at auction. Over the years Mary Margaret met most of her fellow collectors, never turning down a request to see the collection, and always enjoying the exchange of views and the opportunity to both learn and teach - education being one of her passions in life. She always responded generously to any request to either see the collection, or lend from it for exhibitions. The exhibitions she participated in were usually local, but she also sent a number of examples to an important exhibition at the Hong Kong Museum of Art in 1978 (Gerard C. C. Tsang and Hugh Moss, Snuff Bottles of the Ch'ing Dynasty). Those bottles are identified here, but were not in the original catalogue as she was always modest about her collection and loaned her bottles anonymously. It was her generosity, immense enthusiasm and unassuming nature that made her universally loved in the snuff-bottle world and her death was widely mourned. Throughout her collecting career she kept extensive notes and records, and at the time of her death was working with Hugh Moss on a catalogue of the whole collection. Christie's have been fortunate in being able to draw on all of this information for the present catalogue, and acknowledge the wealth of information drawn from her notes and records.